For other uses, see Delta. 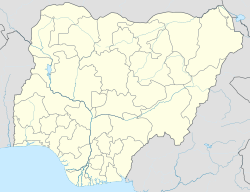 Sapele is a city in Delta State, Nigeria. The origin of the name is believed to be an anglicised derivation of the Okpe (Urhobo) word Uriapele, named after a local deity, the shrine of which can still be found in the centre of the city. It is believed the British colonial authorities changed the name of the then hamlet to Sapele as it was easier to pronounce. Today, the city has one of Nigeria's major ports and also non-salty. Its industries include the processing of timber, rubber, and palm oil, as well as furniture, tamarind balm and footwear manufacturing. As of 1995, its population was 135,800. And as of 2005/2006, the population of this advancing city was 242,652. Chief Hon. Monday. O. Igbuya, A Prominent Politician. Chief David Dafinone, the first family of all chartered accountants, and also listed in the Guineas Book of Records. Chief Omuvwie a very influential industrialist. The Oghene family another great industrialist, whom a street is named after. The Ayomanor family an influential family, that contributed greatly to the development of Sapele. Adogbeji Salubi, "The Origins of Sapele Township", Journal of the Historical Society of Nigeria, Dec. 1960, pp. 115-135. This page was last edited on 16 April 2019, at 13:11 (UTC).